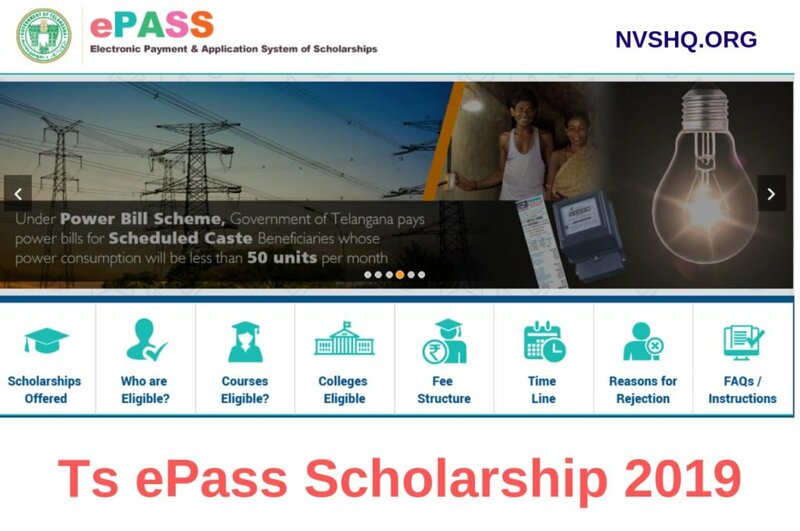 TS ePass Scholarship 2019 applications @ telanganaepass.cgg.gov.in are currently available. Interested students those who are eligible can apply before the due date. TS ePass Application forms 2019 can be filled online on the official portal of ePass. ePass (Electronic Payment & Application System of Scholarships) is an innovative scheme of Government of Telangana to provide a scholarship to the students belonging to backward and minority classes. Every year lots of students apply for a scholarship and get benefitted. 2.1 How to fill TS ePass application form 2019? In this article, students will get the necessary information about the TS ePass Scholarship 2019. Pre Metric Scholarship- Through this scholarship, ePass provide financial assistance to the students of class X (SSC) and below studying in the schools of Telangana. Application registration for all the type of scholarship is currently open. Eligible candidates can submit the application forms before the due dates to get the scholarship benefits. Application forms are currently available for both fresh registration and renewal registration of the application for both Pre Matric and Post Matric scholarships. The last date for submitting an application for Post Matric scholarship is 31st January 2019. Candidates are therefore advised to register in time to avoid disappointment. Students applying for the scholarship must check the eligibility criteria first. Once they have ensured that they satisfy the criteria, they can apply. Students who belong to the category of SC or ST and have parental income 2 lakhs per annum or below. Student who are from BC, EBC, or Disabled Welfare Students categories and have parental income 1 lakh per annum or below. A student who has maintained an attendance of 75% at the end of each quarter. Those who are from categories other than SC, ST, BC, EBC, and DWS(Disabled). Those from SC/ST and BC, EBC and DWS (Disabled)category who have an annual parental income of more than 2 lakhs and 1 lakh respectively. Who has admitted under the management quota seats and sponsored seats. Who are pursuing online courses, part-time courses. EBC students studying Intermediate (class XII) or equivalent. Students from BC, EBC and DWS category studying courses offered by open universities, category B seats in MBBS, BDS, distant mode. Students drawing stipend more than the scholarship amount in aggregate. All Post matric colleges in Telangana recognized by the State Government/ Competent Authority. Group- II –Include technical graduate, other professional programs and PG programs including (M.Phil, Ph.D. and post-doctoral research) level programs not covered in Group- I. All postgraduate, C.A./I.C.W.A./C.S./ etc. courses, graduate-level diploma courses, and all certificate level courses. Group- III Include all degree programs not included in Group I and Group II. It also includes the National Institute of Fashion Technology courses (NIFT) courses. Courses at Pre-Examination Training Centres of State and All India Levels. Eligible students have to fill the application form at the official web portal of ePass. No other mode of application is available other than the online mode. How to fill TS ePass application form 2019? Students willing to fill the application form can follow the given procedure in order to apply online. Applicants have to firstly log in the official website of ePass i.e. www.telanganaepass.cgg.gov.in. They can also click the direct links provided below. On the homepage, students have to open the Scholarship Tabs they want to apply for. For example- Pre Matric scholarship services, Post Matric scholarship services etc. On this webpage, students have to click on the fresh registration link for the concerned category. If they have to register for the renewal they have to click on the same and similarly for other options. Students have to enter the personal details, Qualification details, bank details in the fields provided. Candidates must fill all the details carefully as applications with wrong information will be rejected. After filling all the details, candidates must review all the details and make necessary corrections. Candidates now have to enter the code and finally click on the “Submit Application” button. Lastly, applicants are required to take a printout of the filled in application form. They have to submit a hard copy of the same in the concerned School and college. Registration and application are completely free. No application fee is applicable for any student. Mark sheets and supporting document of the qualifying exam. No recommendation by the Field Officer. Applications for the scholarship are available currently. Only eligible students are required to fill the registration form. The information provided in the application must be authentic in order to avoid rejection of the application. It is compulsory for all the students to submit the hard copy of the filled-in application form in the school/ college. Students also have to visit the concerned department for physical verification after the submission of online application. Field Officer conduct the physical verification process twice a year. Students can check the application status at any time by using the login credentials. Sir I am competed my d. Ed diploma in education in 2016. So I have not received( second year) any scholarship.. Please release my scholarship. My son applied for MS for fall 2019. We belongs to BC ‘D’ . We need Bc overseas scholarship for MS course. My admitts will receive in the month of March 2019. But Bc overseas scholarship dead line is on or before 15th February 2019. Without College admission and visa is not accepting online filling a form. Please guide me how to apply my application for scholship. please suggest how to update/Edit scholar ship type in fresh epass post metric application, unable to edit. I applied for computer software and database development in one of the colleges in Canada. Do colleges are eligible for scholarship? ?